Hi friends! I hope you are doing well! We are doing ok. Dustin went out of town for work today and was gone ALL day. It was a LONG day, I'm just sayin'. That's why I'm blogging so late today. Today, I'm sharing my title page for my 2014 Project Life/Pocket Style Scrapbook album. For this page, I used a Becky Higgins Design A page protector. The cards are from the Project Life 5th and Frolic kit. This is one of the rare times I used mostly a core kit on a page. I'm trying really hard to simplify my album more this year so I can GET IT DONE. That's what I really need. The "Hello 2014" flair is from my friend Taniesa's store, The Craft Pickle. (She has SUPER cute flair, check it out!) I used some Studio Calico wood veneer potty people on this. The alphabet stickers are from American Crafts and the camera clip is from Maya Road. I've been experimenting with my photography on my layouts. I think this is it. I should probably pull everything out of the pockets, but with the kids running around all the time and my desire to use natural light on these, it's challenging. We shall see. Have a wonderful day, friends! Great page! 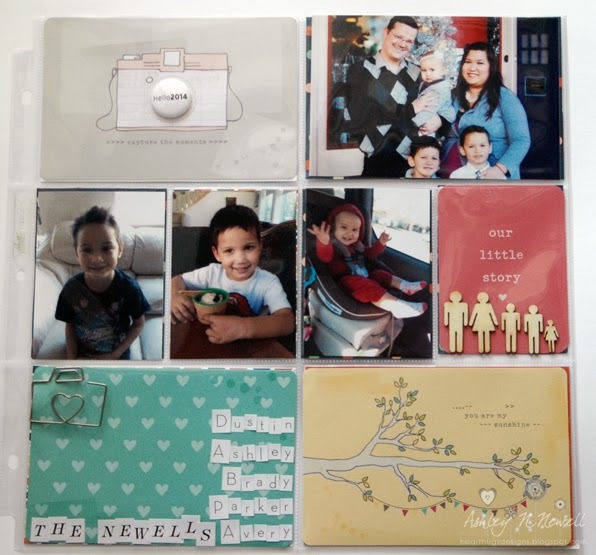 Love journaling cards you used and I love that family photo! Great title page. I love the little wood people! Thanks for the fun day today! Being home alone is so hard for me too! I love how your title page turned out. That is one of my favorite core kits. I'm trying to keep my PL simple this year too, fingers crossed!